It is with great sadness that we note the passing of Mr Peter Gray. Peter was one of the Association leaseholders and owned the land surrounding the most popular, and arguably the best section of our Beat, at Wolfclyde Bridge. Many of you who fish that section regularly will no doubt have seen Peter in the past patrolling the fields on his quad bike or in his Gator checking or feeding his livestock. On many of those occasions he would take the time to stop and talk to the Anglers and would always have a tale to tell of the river both past and present along with putting the World to rights on many subjects. An hour of conversation with Peter by the river bank was not unusual, and I for one will greatly miss our conversations. As well as his love for farming Peter took a great interest in the work of our Association and the work to conserve the river and all the wildlife and habitat surrounding it. It would be safe to say that without his and his family’s support and goodwill towards the Association over a great many years we would not have such a fantastic section of river to enjoy. On behalf of all our members the committee would like to express our sincere gratitude to Peter and extend our deepest sympathies to his family. Thank you Peter, you will be sadly missed. A few changes have been made with regards to the Annual permits, association rules and permit outlets for 2018. Most notably annual permits now require a passport sized photograph, this will be attached to your permit by the staff at the permit outlet so please bring one passport sized photograph with you when you purchase your permit. The chemist in Biggar has a photo booth should you forget before setting out but it would make things easier all round if you make sure you have one before travelling as the chemists opening hours are different from the permit outlets. The price has also risen this year to £60 for the full annual permit, all other permit types have pricing frozen from last season. Unfortunately Lanark Tourist information office has closed so at this point in time permits are not available anywhere in Lanark if this changes we will of course let you all know. The Association has also altered one of the permit rules for the coming season. Where we have always had a kill limit of two fish with a minimum size of 12 inches 〈30cm〉 we have now also introduced an upper size limit as well with a view to protecting the rivers prime breeding stock, the upper kill size has now been set to 16 inches 〈41cm〉 and any fish taken must now be between the upper and lower size restrictions. The AGM has now been re-scheduled for the above date. All full season ticket holders welcome. Due to adverse weather conditions the AGM has had to be postponed. We apologise for the lateness of the decision but we feel it would be irresponsible to expect our members to attend with the road conditions as they are now, especially with the expectation that the conditions will only worsen as the night goes on. We value everyones attendance and the chance they have to get any points across they feel need to be raised so with only members living very close by likely to attend we feel it is the right decision to postpone and re-schedule. Again, our apologies. A new AGM date will be posted as soon as it can be arranged. We are currently looking into the feasability of making the addition of a passport sized photograph a requirement for all 2018 full season permits. At the moment we are checking this out with our permit printers and assessing samples. We will also discuss this with our permit outlets but at this time we do not forsee any major problems which will prevent this being a requirement from next season onwards. This will make life easier for our full time bailiff and volunteer bailiff's and also prevent “permit sharing”. When the details have been finalised we will update the news section with further information and list places near our permit outlets where passport photographs can be obtained. This will not affect day or weekly permits and will be for full season permits only. New rule for 2014 season. No guiding without prior written permission. Guided fishing is no longer permitted on Lamington & District Angling Improvement Association water without prior written permission and where permission is granted the permission letter must be carried for inspection by the bailiff. This new rule is highlighted on this years permits as well as here on the website and the secretary will also be writing to different angling bodies. As such ignorance of the rule will not be deemed an acceptable excuse and any guides found to be working the river without carrying the written permission letter will be asked to leave the river. The Association respects the role of guides and instructors, especially when it comes to helping newcomers to the sport however with limited space on the riverbank our season members access to the fishing must remain our highest priority. When the subject of guiding was raised at the AGM several proposals were offered by members and the committee with the rule now in place being passed with a unanimous vote. We believe this rule is being introduced for all the right reasons and while it is not an outright ban on guiding it will be used to prevent large guided parties restricting the access to fishing for season members, especially at known busy periods of the season. Following our constitution it should be noted there is no burden of proof put on the bailiff, he has full authority to make judgements on the riverbank as he see's fit and any anglers put off the river have an appeals process to follow that the bailiff will inform them of. In the event an angler disagrees with the decision of the bailiff they are required to follow his instruction on the riverbank and advised to make their objection known to the secretary in writing by e-mail to info@lamingtonfishing.co.uk or by post to L&DAIA Secretary, 71 Russell Street, Wishaw, ML2 7AL. The secretary will raise the matter with the committee and reply at the earliest convenience. We appreciate the assistance of all recognised angling bodies and their members as we police this new rule in the coming season. Unfortunately the picture above only represents half of the debris picked up from only a mile of water on two banks. 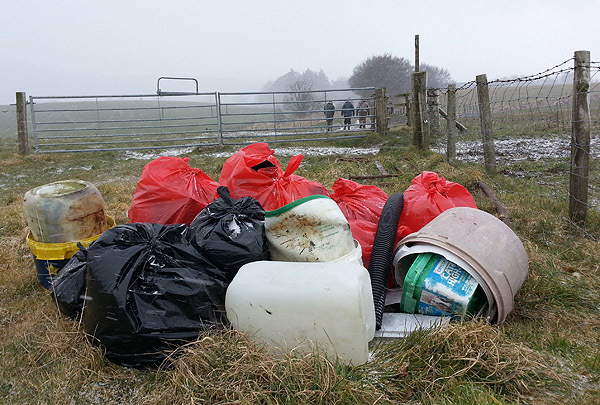 A lot of that is of course washed downstream from other places and gathers on the flood plain, so it's not quite as bad as it seems and we are lucky in that the vast majority of our members either take their rubbish home or make use of the bins provided near some of the parking areas. But the picture does show that maybe we could all make a little more effort, we all get to enjoy good fishing in beautiful countryside and taking good care of that is in all our interests. Thank you all for your continued help in keeping the riverbanks clean, your efforts are appreciated. George, known to many as Geordie, died 21st April 2010 following a short illness. George was a lifelong Association member and served on the committee as Association treasurer for many years, providing stability, continuity, local knowledge, enthusiasm and encouragement to all who worked alongside him for the benefit of Lamington & District Angling Improvement Association and the Clyde. George could be seen almost every day on the river, and was always delighted to stop and talk about fishing in general, and fly fishing for wild brown trout in particular – it can be said that he had Clyde Water running in his veins. He was generous with his time and expertise, happy to pass on tips and knowledge to beginners and experienced anglers alike. Many times he’d go home with his fly box lighter, happy to have helped a struggling angler to catch trout. His commitment to educating the next generation of anglers was demonstrated in his support for the Clyde in the Classroom project run by the Clyde River Foundation, who will benefit from the retiring collection held following his funeral. 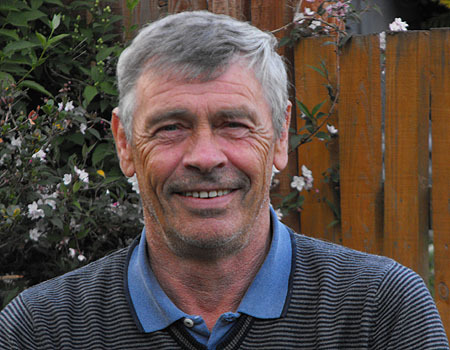 He was passionate in his defence of the river, and over the last year, worked unstintingly as a founder member of CRAG (Clyde River Action Group) against a proposal for a sand and gravel quarry at Overburns, Lamington. His knowledge of the river environment and ecology was greatly appreciated and valued by all who served with him on the action group committee, and he will be sorely missed. George’s greatest pleasure was reserved for his family – his wife of 41 years, Nancy, daughters Joanne, Lorna and Rebecca, and his grandchildren Logan, Lyle, Louis, Olivia, and twins Ava and Freya. The Clyde has lost a great champion, and I have lost a good friend.